ACTIVITY in Dimensional Analysis, Measurements. Last updated January 30, 2019. In this activity, students will convert between English and metric units in order to scale from research lab (small) scale to manufacturing (large) scale. Students will also apply critical thinking skills in order to analyze data given and evaluate cost effectiveness. HS-ETS1-3: Evaluate a solution to a complex real-world problem based on prioritized criteria and trade-offs that account for a range of constraints, including cost, safety, reliability, and aesthetics as well as possible social, cultural, and environmental impacts. Accurately convert between units of measurement. Increase a small scale reaction to a large scale reaction. Analyze graphical and tabular data. Apply analysis of data to solve business problem. It is recommended that students complete this activity with a partner. There are also temperature conversions (°C to °F), volume conversions (mL to L, gallon to L), and metric conversions (g to kg). There are calculations of scale. A reaction of small (research size) quantities is scaled up to large (manufacturing) quantities. Teacher may wish to introduce scaling concept through an analogy such as scaling up a recipe. Teacher will need to provide conversion factors (depending on ability level of students). Differentiation could be guided instruction versus independent work for the conversions. Students are required to find volume from mass and density. The accommodated data sheet has this conversion done for the student. The critical thinking portion of the activity includes graph analysis (of temperature ranges) and tabular analysis (manufacturing costs) for different vendor manufacturing locations. Students will apply critical thinking skills to choose the best vendor for the production facility, which may not be the one that has the lowest cost. Students who have read carefully should consider that the “product” is known to break down at certain temperatures – this should influence the decision on which vendor is chosen. Teacher could point out that these conditions exist or use this as a grading point for rubric. Please note that the economic information (the cost of the manufacture of the product) is reported through many cost lines (labor costs, energy costs, etc.) These costs are not reported with universal rates. Some are reported with weekly, monthly, etc. 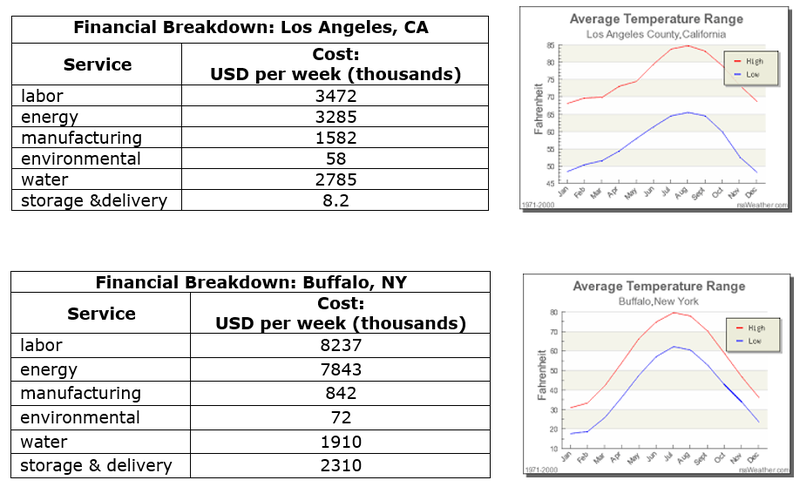 The accommodated data sheet provides all data with consistent rates - weekly. Several extension analysis questions are provided. These can be assigned to partners or allow choice for independent student work. 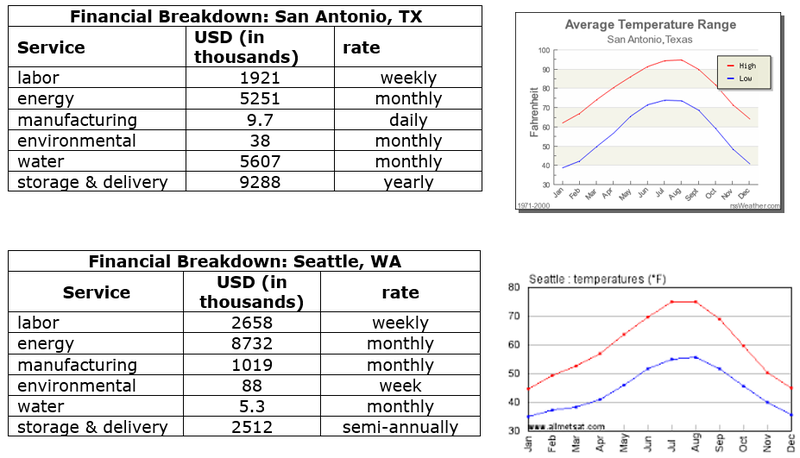 Graphs including temperature information are from Weather.com. Answers are provided in a separate document. Jasmine is a synthetic polymer chemist at WOW Chemical Company in the Research & Development division. Her marketing manager has come to her with a problem: the makers of flat-top stoves have had an issue with the stove top being too brittle. One pan misplaced causes a crack in the stovetop. Since this is covered under warranty the manufacturer has to replace either the stovetop or the entire stove. This is eating into their business profits! Jasmine and her team are tasked with coming up with a polymer coating for the stoves that will stop these cracks from forming. The team comes up with a few different substances and takes them to the applications lab to test them. None of the substances have an appreciable effect on the strength of the stovetop, however while testing the third substance, something quite serendipitous occurs. One of the workers spills a drop of the test polymer on his phone. He isn’t terribly upset because his phone has a large spider web of cracks on it from a recent accident and is due to be replaced. However, to his surprise, as he wipes off the polymer drop he notices the miracle. The cracks in his cell phone screen have vanished and it is as good as new! Although Jasmine’s team has not yet solved the stovetop problem, they have solved something much, much bigger. They’ve made a product that has a huge potential market. They decide to call this product Glubber! Determine the best vendor choice for this job, providing evidence and reasoning behind this decision. Viscohexane should be rotated consistently. Elastigoop should be added rapidly. After complete mixing, oozypullpush is added rapidly. Upon completion of mixing, substance will change from opaque to transparent. Finally, the addition of the emulsifactate must occur gradually over a 10 minute period. Rapid insertion will lead to inconsistency of the product. It is important that the reaction never gets above 100°C or the reactants may degrade. If the reaction gets below 25°C there may be crystallization of the elastipentagoop-oozypullpush complex. Granulation at this stage is irreversible. Product must be washed thoroughly at least 4 times with purified water. Glubber comes out of the reaction as a liquid with a density of 2.5g/mL. Glubber is stable up to temperatures of 55°C. Any location that has average temperature of greater than 29°C or less than -5°C for a month has a distinct possibility of product degradation (unless the warehouse is climate controlled). Los Angeles warehouse is air-conditioned. How much Glubber does WOW chemical company need to manufacture per week? What is the volume of product yielded from the reaction? Show all calculations. Hint: You will need to use the density value of Glubber. Fill in the final answers in the table. Show all calculations necessary in the space below the table. Percent Yield is a concept that is very important to chemists. One predicts how much product one should make from the reaction (theoretical yield), then, one compares how much one actually got (actual yield). For example, if a chemical reaction predicts that I will make 20g of product, but I only made 18g, my percent yield is 18/20 or 90%. (It’s almost like a test grade for chemists!) Assume that Glubber is the only product of this chemical reaction. What is the theoretical yield of the reaction? What is the actual yield? What is the percent yield? How would this affect the cost of the product? As a business leader, what would you do? Look carefully at the chemical process described in the data section. Describe at least three accommodations that factories must put into place to ensure that the final product is good. Supply and demand is a very important consideration for businesses. It is used by WOW Chemical executives to figure out how to price a product. Explain how this would be used to decide how to decide what price to charge for a product. If the cost of viscohexane doubled, how would this affect the price of the product? Why?